We report here a case of deferoxamine (DFX) related gastrointestinal bleeding and duodenal perforation in a cirrhotic patient after the use of deferasirox for secondary hemochromatosis. Duodenal ulcer bleeding and perforation is noted as a rare adverse event in the scientific product information of deferasirox, in our current knowledge, this is the first case-report on this adverse drug reaction at adult patients. Clinicians must be aware that deferasirox use in a cirrhotic patient may have a potential risk of complicated gastrointestinal ulceration. It is recommended that patients undergoing treatment with deferasirox especially with liver cirrhosis are monitored regularly for adverse events. Gastrointestinal bleeding, Duodenal ulcer, Deferasirox, Liver cirrhosis. Patients receiving multiple transfusions for anemia are at a great risk of developing secondary hemochromatosis. Iron overload represents a major concern in secondary hemochromatosis because it is a leading cause of morbidity and mortality in patients who do not receive proper iron chelation therapy . The oral iron chelator deferasirox is licensed in over 70 countries worldwide . Before deferasirox was approved, two other iron-chelating agents were licensed for treatment of iron overload, namely desferoxamine and deferiprone. Deferasirox is a novel iron chelator which can be administered once daily orally, resulting in an increased survival for secondary hemochromatosis these patients . The main adverse events of deferasirox are transient gastrointestinal complaints [4,5]. Gastrointestinal bleeding and perforation related to deferasirox has been reported in children [6,7]. Best to our knowledge gastrointestinal bleeding and perforation has never been reported in the adult. We report here a case of deferoxamine related gastrointestinal bleeding and duodenal perforation in a cirrhotic patient treated with deferasirox for secondary hemochromatosis. A 69-year-old female was diagnosed with haemolytic anaemia and subsequently received multiple red blood cell transfusions (36 units in two year) at another hospital. She was sent our clinic for the suspicion of chronic liver disease. Patient was hospitalized. She had type 2 diabetes mellitus (DM) and metabolic syndrome. She was using subcutaneous insulin analogues; amlodipine besilat and proton pump inhibitor. The body mass index of the patient was 32. No active alcohol or illicit drug use was reported. Laboratory studies revealed that AST/ALT levels were 87/65 U/L respectively. Ferritin levels were 2480 g/L, Fe was 150 μg/dL and total iron binding capacity was 90 μg/dL and transferrin saturation was 55%. Ultrasound of the liver revealed a heterogeneous parenchyma structure, an irregular edge and grade III steatosis, spleen length was 140 mm. Gastroscopy showed grade 1 esophageal varices, without other pathological features. Other reasons that may lead to cirrhosis were investigated. Chronic viral hepatitis panel for hepatitis B and C were negative. The laboratory tests for Wilson disease, hemochromatosis and α1-antitrypsin deficiency were unrevealing. Hemochromatosis gene analysis (C282Y and H63D mutations) was negative. Magnetic resonance imaging demonstrated decreased signal intensity in the affected liver parenchyma on the in-phase images compared with the out-of-phase images (Figure 1). Child and MELD scores of the patient were 6 (A) and 10 respectively. We decided that the reason of chronic liver disease could be the combined effects of nonalcoholic steatohepatitis and secondary hemochromatosis due to excessive blood transfusion which caused iron overload. The cause of anemia was investigated. Laboratory studies about hemolysis showed that the haptoglobulin level was very low and LDH and indirect bilurubin leves were high. Coombs test was positive. Serological markers for anti-nuclear antibody (ANA), Epstein Barr virus and cytomegalo virus were negative. We decided to start deferasirox at a dose of 1 g/day for secondary hemochromatosis. Two weeks later after starting deferasirox she was admitted to our institution with abdominal pain and melena. She denied any use of nonsteroidal anti-inflammatory medications, acetylsalicylic acid, bisphosphonates, antibiotics or other medications. Laboratory studies showed anemia (Hgb 5.7 mg/dl) and leukocytosis (21400/mm3) with a neutrophil predominance. Kidney functions were normal. Upper gastrointestinal endoscopy revealed a large ulcer at the bulbus of the duodenum which expands till the second part of the duodenum. There was no active bleeding but a large fixed coagulum at this area. There is no sign of variceal bleeding. Pantoprazole infusion was started and 4 units of red blood cell transfusion were given. The day after, her abdominal pain persisted; at physical examination rebound tenderness was observed. 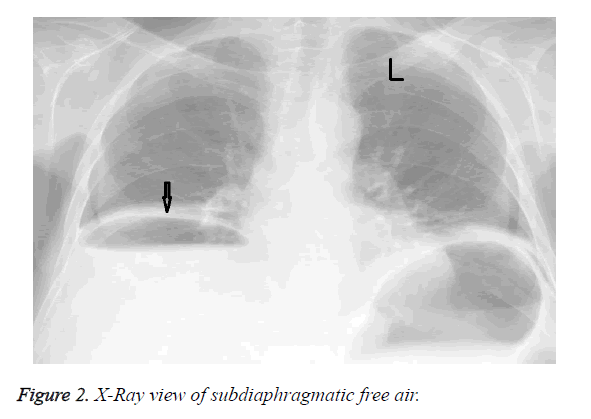 Abdominal X Ray scan showed subdiaphragmatic free air (Figure 2). Emergency surgical consultation was done but she was transferred to the intensive care unit because of the hypovolemic shock before the surgical operation. A diagnosis of deferasirox-induced gastrointestinal bleeding and perforation was therefore made. The patient was unresponsive to the intravenous fluids infusion of and to the vasopressive treatment. The patient died before emergency surgery could be performed. Figure 1. 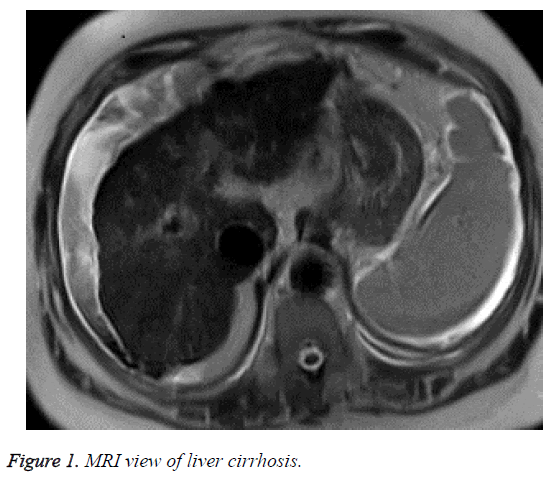 MRI view of liver cirrhosis. Figure 2. X-Ray view of subdiaphragmatic free air. Patients with cirrhosis are at risk for both variceal and nonvariceal causes of upper gastrointestinal bleeding; however, only variceal bleeding has been widely studied. Nevertheless, there remains one third of non-variceal upper gastrointestinal bleeding in cirrhotic patients due to peptic ulcers (PU) as reported in the literature . In addition, bleeding PU has been associated with substantial morbidity and mortality in cirrhotic patients . Peptic ulcers have frequently been associated with liver cirrhosis. There is a 5- to 8-fold increased risk of duodenal ulcers in patients with cirrhosis compared with the general population [10,11]. Patients with cirrhosis and bleeding peptic ulcers had a mortality rate of 20%, which was higher than that in patients without cirrhosis . The factors which are responsible for the increased prevalence of peptic ulcers in patients with cirrhosis are still unknown. It has been demonstrated that the gastric mucosa of rats with portal hypertension is more susceptible to aggressive agents, such as bile acid and alcohol than that of healthy rats [13,14]. Long-term transfusion therapy leads to iron overload and results in significant morbidity and mortality if left untreated . Using iron-overload chelation therapy improves patient survival [16,17]. Deferasirox is highly selective for ferric iron, with which it forms a stable complex in a 2:1 ratio. The deferasirox-ferric iron is eliminated predominantly through feces. Its high bioavailability and long half-life means it is suitable as a once-daily oral treatment . In the literatüre, in relation to about advers effect deferasirox, Huang et al., found significant higher risk of GI bleeding associated with deferasirox use . To our best knowledge, we report the first case of gastrointestinal bleeding and perforation associated with the use of deferasirox in an adult patient. Other potential causes of gastrointestinal bleeding and perforation like non-steroidal anti-inflammatory medications have been ruled out in our case. In our case portal hypertension induced gastropathy and thrombocytopenia might have induced tendency to gastrointestinal ulceration. Our case illustrates these potential risk factors for deferasirox-induced gastrointestinal bleeding and perforation. We must be aware that this single case report does not prove any causality link with gastrointestinal ulcer and deferarsirox. Clinicians must be aware that deferasirox use in a cirrhotic patient may have a potential risk of complicated gastrointestinal ulceration. Careful monitoring is mandatory for patients undergoing treatment with deferasirox especially in patients with portal hypertension associated with liver cirrhosis. Schrier SL, Angelucci E. New strategies in the treatment of the thalassemias. Annu Rev Med 2005; 56: 157-171. Kontoghiorghes GJ. Deferasirox: uncertain future following renal failure fatalities, agranulocytosis and other toxicities. Expert Opin Drug Saf. 2007;6(3):235-239. Sechaud R, Robeva A, Belleli R, Balez S. Absolute oral bioavailability and disposition of deferasirox in healthy human subjects. J Clin Pharmacol 2008; 48: 919-925. Cappellini MD, Cohen A, Piga A, Bejaoui M, Perrotta S, Agaoglu L, Aydinok Y, Kattamis A, Kilinc Y, Porter J, Capra M, Galanello R, Fattoum S, Drelichman G, Magnano C, Verissimo M, Athanassiou-Metaxa M, Giardina P, Kourakli-Symeonidis A, Janka-Schaub G, Coates T, Vermylen C, Olivieri N, Thuret I, Opitz H, Ressayre-Djaffer C, Marks P, Alberti D. A phase 3 study of deferasirox (ICL670), a once-daily oral iron chelator, in patients with beta-thalassemia. Blood 2006; 107: 3455-3462. Stumpf JL. Deferasirox. Am J Health Syst Pharm. 2007; 64: 606-616. Yadav SK, Gupta V, El Kohly A, Al Fadhli W. Perforated duodenal ulcer: a rare complication of deferasirox in children. Indian J Pharmacol 2013; 45: 293-294. Bauters T, Mondelaers V, Robays H, Hunninck K, de Moerloose B. Gastric ulcer in a child treated with deferasirox. Pharm World Sci 2010; 32: 112-113. Hsu YC, Liou JM, Chung CS, Tseng CH, Lin TL, Chen CC, Wu MS, Wang HP. Early risk stratification with simple clinical parameters for cirrhotic patients with acute upper gastrointestinal bleeding. Am J Emerg Med. 2010; 28: 884-890. D'Amico G, De Franchis R. Upper digestive bleeding in cirrhosis. Post-therapeutic outcome and prognostic indicators. Hepatology 2003; 38: 599-612. Kirk AP, Dooley JS, Hunt RH. Peptic ulceration in patients with chronic liver disease. Dig Dis Sci 1980; 25: 756-760. Lenz HJ, Hogan DL, Isenberg JI. Intestinal phase of gastric acid secretion in humans with and without portacaval shunt. Gastroenterology 1985; 89: 791-796. Lai KH, Tsai YT, Lee SD, Ng WW, Teng HC, Tam TN, Lo GH, Lin HC, Lin HJ, Wu JC. Phase II study of mitoxantrone in unresectable primary hepatocellular carcinoma following hepatitis B infection. Cancer Chemother Pharmacol 1989; 23: 54-56. Sarfeh IJ, Tarnawski A, Malki A, Mason GR, Mach T, Ivey KJ. Portal hypertension and gastric mucosal injury in rats. Effects of alcohol. Gastroenterology 1983; 84: 987-993. Sarfeh IJ, Tarnawski A, Maeda R, Raymont K, Mason GR, Ivey KJ. The gastric mucosa in portal hypertension: effects of topical bile acid. Scand J Gastroenterol 1984; 92: 189-194. Jabbour E, Kantarjian HM, Koller C, Taher A. Red blood cell transfusions and iron overload in the treatment of patients with myelodysplastic syndromes. Cancer 2008;112: 1089-1095. Neufeld EJ. Oral chelators deferasirox and deferiprone for transfusional iron overload in thalassemia major: new data, new questions. Blood 2006;107: 3436-3441. Maggio A. Light and shadows in the iron chelation treatment of haematological diseases. Br J Haematol 2007; 138: 407-421. Bruin GJ, Faller T, Wiegand H, Schweitzer A, Nick H, Schneider J, Boernsen KO, Waldmeier F. Pharmacokinetics, distribution, metabolism, and excretion of deferasirox and its iron complex in rats. Drug Metab Dispos 2008; 36: 2523-2538. Huang WF, Chou HC, Tsai YW, Hsiao FY. Safety of deferasirox: a retrospective cohort study on the risks of gastrointestinal, liver and renal events. Pharmacoepidemiol Drug Saf 2014; 23: 1176-1182.